My blue, mechanical-winged Lupe, Lunetua (odd name, I know, but I like it), had a terrible case of Ugga-Ugga, and I had no cure. The only cure was Sporkle Syrup, and that's rare enough as it is. The poor thing's throat is so sore, so swollen, that all the noise she can make is "Ugga-Ugga". I was the one who fed her the rotten omelette. Oh, I had such a bad feeling about it, but I was stupid enough to feed it to her! I felt so terrible, and I couldn't find a cure. Every day I stayed at my Shenkuu-ian home to take care of her instead of begin in the Games Room earning Neopoints. The poor thing was miserable. Her usually sleek pelt was ruffled and dull, and her eyes lacked that usual treasure-hunting spirit. I was so upset. The guilt ate at my gut, and I couldn't bring myself to look at her most of the time. But when I did, tears brimmed my eyes and I needed to step outside for a moment. As I said before, the only cure for Ugga-Ugga is Sporkle Syrup. I tried every method. The Pharmacy, Shop Wizard... I even asked the Healing Faerie if she could do something. Every time I went, I got either Lunetua's hit points restored or a battle potion given to me. 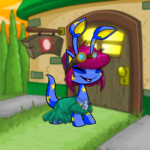 I mean, I know she's a very busy Faerie, but I was so worried about my poor Neopet that I couldn't help but feel angry. And then I felt even worse because I knew I shouldn't be angry at her. As I trudged through the merchant part of Neopia Central, I still couldn't help but feel terrible. There may be an instant cure to Ugga-Ugga, but guilt is a long-lasting disease. "Excuse me... Mr. Shop Wizard?" I called, peeking my head in the door. "Hmm?" the fuzzy Shop Wizard asked. "Oh, hello, Sakra." The JubJub bounced to face me. "Trying to look for Sporkle Syrup again?" "Yes, sir," I answered. The JubJub focused his powers and energies into his kind, searching every corner of shops in certain area. His eyes shot open, and he looked at me with eyes filled with sorrow. "I'm sorry," he apologized. "I'm afraid I couldn't find anything. Well, at least anything you can afford." "It's just at my limit." "Yes. As you can see, I can't do much for you. I apologize." I hung my head. I could never find anything. "Thanks again, Mr. Shop Wizard," I said drearily, stepping outside. I headed towards the center of town. Neopets of all species, sizes, and colors were bustling around with their owners, shouldering past me. In the rainbow of colors, I might as well have been slathered with a Grey Paintbrush. I went to check the Pharmacy. "Nothing?" I exclaimed. "There's no syrup?" "Well," the Elephante at the counter began, "we do have Kikoughela Syrup..." I was furious. "I meant Sporkle Syrup!" I snapped. The Elephante jumped and stared at me in horror. "I... I think it's time for you to leave, miss," she suggested. I stomped out of the Pharmacy, steam still emitting from my ears. I felt my Neomailer vibrate. Lunetua just shot me a Neomessage. Did you find anything? she asked. No, I typed back. Shop Wizard couldn't find anything, and the Pharmacy's clean. Why don't you just paint me Grey and be done with it if you're gonna leave me like this?! Lunetua typed. I nearly dropped my neomailer. She must be in so much pain. She must be so sick. I was on the verge of tears. 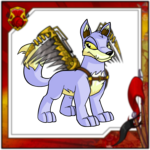 My own Neopet was telling me to paint her Grey. No, Lunetua, I responded. Never, EVER ask me to do that again. I WON'T paint you Grey, and I WILL find you a cure. I'll believe it when I see it, Lunetua answered. I flipped my Neomailer shut. Suddenly, I started crying and ran. I wasn't sure how far I had run until I ended up near Faerieland. I took one, long look at the formerly floating city of Faeries and stomped towards the city. Luckily, I went to a quiet part of the city, where there wasn't anyone there. I collapsed on a rock that was near a river in exhaustion and bawled my eyes out. I didn't know what to do. I was so confused. My pet hated me, and right now, I hated myself. My pet hated me. She wanted me to paint her Grey. GREY. How could I even think of doing that? I snapped at the poor pharmacist. She didn't do anything wrong. It was me. All me. I caused this, and karma bit me right in the tail. Y'know, if I HAD a tail. "What's wrong?" a soft voice asked after a few minutes of nonstop crying. I looked up, my eyes red. I saw the electric blue eyes and the aqua-colored makeup of the Healing Faerie. She had no wings, but a bright aqua tail. She was swimming in the river. "Why are you crying?" she asked, her eyes full of sympathy. "M-My pet has a t-terrible disease and I don't have a c-cure and I can't f-find one!" I sobbed miserably. The Water Faerie looked up at me sadly. "Oh, I remember you," she said, remembering the previous encounters I had with her. "You've been visiting my Springs a lot lately, haven't you?" "I hoped that you would be able to cure her," I admitted, wiping the tears away on my sleeve. "I've been so stressed out the past few days that I've been pulling out my hair. The Shop Wizard's finds are too pricey, and the Pharmacy's cleaned out..."
"I'm afraid that I have been very stressed out as well," she told me. "I must have mixed up some of the orders. I give people my magic, which is what they want. Sometimes... it's just not what they want nor need. I apologize. What does your pet have?" "Ugga-Ugga," I answered. "Pretty bad case." The Healing Faerie closed her eyes and snapped her fingers. "Not anymore." She smirked. My mouth dropped. "Y-You're serious, right?" I asked, disbelieving. "Sh-she's cured?" The Water Faerie beamed at me and nodded. "Th-Thank you..." Tears brimmed my eyes again. My pet was going to be alright. "Hang on... aren't you, like, supposed to be at the Healing Springs?" I asked. "I'm not always, there," she answered, smirking again. "Sometimes I escape for a few moments. I'm already as late as it is right now. The line must reach all the way to Meridell by now." "I feel sorry for you," I told her sincerely. She smiled at me. "Good luck, young one," she said. Then, she dived underwater. Her dark silhouette shimmered in the waters and disappeared, leaving me alone. The joy building up inside of me allowed me to go to Shenkuu without passing out from exhaustion. "Lunetua!" I called. "Are you awake?!" "Well, I am now," someone responded groggily. "Loony!" I called again, running towards my pet, using the affectionate nickname I had for her. She had emerged from her cover of the beds and was stretching her tired, stiff limbs out on the floorboards. I dropped to my knees, sobbed a little, and wrapped my arms around her neck in an embrace. "I'm so glad you're okay," I told her. "It was so trippy!" Lunetua exclaimed. "One minute, I was feeling absolutely terrible, the next, I could feel my throat deflating and I could breathe again!" Looks like the Healing Faerie really was serious, I thought gratefully. "Hey, Sakra..." my pet started sheepishly. "I'm... I'm sorry I told you to paint me Grey earlier. I was just..."
"In a lot of pain," I finished for her, holding her out at arms' length. The Lupe nodded. Tears brimmed both our eyes. We weren't ever going to let something like that make us fight again. "Now, why don't you go get some sleep," Lunetua suggested. "Where'll you be?" I asked, yawning. "Games Room," she answered, turning to go. "I'm aiming for a trophy this time." She applied her specially crafted mechanical wings. "Good luck," I chuckled, climbing into bed. "Oh, and Sakra?" she said. "...Thanks." And with that, she left, and I gave in to the only comforting darkness. If you're considering a new pet, this could show you why to pick a Grundo and which color to pick.